Edgar Wright parting ways with the Marvel after working on Ant-Man for eight years was a big deal in geek circles. After all, he’d been attached to the project before the Marvel Cinematic Universe even existed, so the idea that creative differences would crop up at the last minute seemed strange. What isn’t strange, however, is that the resulting film, directed by Peyton Reed, seems weaker as a consequence of Wright’s departure. Marvel fatigue is bound to set in someday, but I don’t think this is the problem with Ant-Man. I was quite excited to see a new superhero onscreen after seeing all the other more recognisable faces in multiple films. I also knew very little about the Ant-Man comics, so was excited to see something fresh. Fresh, this film certainly is not. 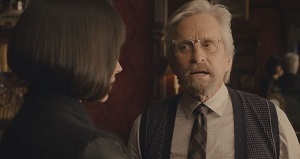 The film sees ex-con Scott Lang (Paul Rudd) recruited by Hank Pym (Michael Douglas), the former superhero, albeit a superhero that the world never knew. What follows is standard Marvel fare, except for the fact that it teeters into heist movie territory. First off, let’s deal with what Ant-Man gets right. As usual, Marvel has done some superb casting, particularly with the supporting players. Michael Douglas is having a fantastic time, and his ever-present voice lends an air of legitimacy to proceedings. Evangeline Lily does a great job, even if her role isn’t as substantive as it should be, whilst Michael Peña frequently steals the show as Scott’s lawbreaking colleague. Secondly, we have some of the finest VFX I’ve ever seen in a Marvel movie. This is particularly surprising after the slapdash approach of Avengers: Age of Ultron, and perhaps has to do with the fact that such effects-heavy scenes were always going to be a challenge this side of Honey, I Shrunk the Kids, so they did their homework first. All the micro-moments utilise the nifty tilt-shift effect (or a digital approximation of it), previously seen in the likes of the rowing regatta scene from The Social Network, and it looks splendid. What’s more, we have a 1987-era Michael Douglas thanks to some digital trickery that was close to perfection; I had no idea what I was watching, all I knew is that it was streets ahead of the digitally youthful Jeff Bridges from TRON: Legacy. Finally, the action is great. It’s well-staged, shot and edited, and there’s some really original fights on display. 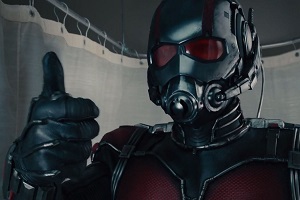 Surprisingly, it’s Ant-Man’s sillier powers that yield the most enjoyable scenes. I never thought I’d find a tiny man riding at the head of an ant army that exciting; how wrong I was. 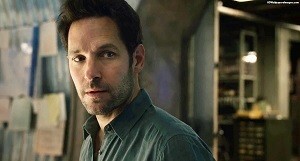 These admirable qualities are overshadowed by a couple of problems, however, the first being Paul Rudd. Now, I’m usually a huge fan of his, and he has the acting chops to create a flawed yet likable leading character, à la I Love You, Man. Here, however, he’s merely present. He looks awkward in practically about every scene, standing there unsure of his purpose. I don’t know if they were aiming for lovable rogue, career criminal desperately trying to go straight or regular joe, but it simply doesn’t work. Going back to Wright’s departure, there was a lot of people online assuming that he’d had trouble with integrating this film into the MCU, but after seeing the film I wonder if that was really the case. When you consider Scott Pilgrim vs. the World, Shaun of the Dead and The World’s End, the thing that ties those three films together is their incredibly flawed protagonists. Watching Ant-Man, I felt that there was a more interesting character lurking beneath (maybe not as extreme as ‘The Irredeemable Ant-Man’, but something similar) and that Marvel wasn’t willing to take that risk. At the end of the day, all we’re left with is a kind-of sort of Howard Stark lite, and he’s too bland to have the movie named after him. The second, much smaller (heh), problem is that yet again we have a plot concerning mad science being used to create super-soldiers, just like we did in The Incredible Hulk, Captain America: The Winter Soldier and Iron Man 1–3. This entry was posted in Film Reviews and tagged Action/Adventure, Comedy, Heist, Science Fiction by Stuart Wilson. Bookmark the permalink.